CASA TEULADA 2 is the latest addiction to the extremely successful CASA TEULADA, featured in magazines worldwide. Ideally located on one of the last unspoilt areas of Sardinia, still close to vibrant Cagliari and easily reachable via a 35 mile breathtaking coastal road, CASA TEULADA 2 is a very peaceful 1st floor apartment, fully furnished with all mod cons and extremely close to unspoilt postcard-like beaches. Tastefully decorated self-catering unique hideaway with large terrace, outdoor dining, shower & bbq, CASA TEULADA 2 has been completely renovated, air conditioned, and boosts a huge stone fireplace for romantic winter escapes. Its particular structure, together with its sister properties, CASA TEULADA 1 & 3, makes it the number one ranking house in Teulada, and one of the most striking examples of unparalleled architectural recovery in the south-west of Sardinia.You may see a full video presentation on YouTube by searching CASA TEULADA. Sardinia: Sardinia is one of the most beautiful and unspoilt regions of Italy, and yet it is not as popular among foreigners. Considered by many the Caribbean of Mediterranean sea, it is filled with postcard-like beaches, pristine waters and incredible landscape. The southern area is where you want to be if you are seeking a unique hideaway and a romantic escape, far from crowds and isolated in your own tranquillity and privacy. With this philosophy in mind, we first set up our home here, CASA TEULADA, which we opened to guests who want to experience a unique hideaway destination. The unexpectedly high demand for CASA TEULADA led us to acquire the adjoining part of the big rural home and courtyard, thus creating the new CASA TEULADA 2 and CASA TEULADA 3, opened as well to guests who seek an unforgettable holiday in a place so far unparalleled in the entire area for its beauty and charming atmosphere. CASA TEULADA and CASA TEULADA 2 & 3 will be truly your 'Home away from Home'. Location: Ideally located on one of the last unspoiled areas of Sardinia, still close to vibrant Cagliari and easily reachable via a 50 mile breathtaking coastal road, Casa Teulada is close to unspoiled poscard-like beaches, the first one being just 5 minutes away. 20 miles of coastline beaches surround the entire area around Capo Teulada, the Cape, where Casa Teulada is strategically located. Eastwards you find the famous beaches of Tuerredda and Piscinni, westwards the striking dunes at Porto Pino.The award-winning wine estate of Santadi, known for its quality wine, is also minutes from our home. So is the Is Molas Golf Course and the Is Zuddas stunning caves. The area around Teulada is also filled with walking trails across the mountains and is great for bird watching and trekking. CASA TEULADA proudly announces its No.1 position on Holiday Rentals Italy's Top 10 Most Reviewed Properties as proof of reliability and quality service! Come in now. How to get there: Plane to Cagliari, Olbia or Alghero. Ferry from Genova,Livorno,Civitavecchia to Cagliari, Olbia, Porto Torres. From Cagliari take road SS195 direction Pula, Chia, Domus De Maria and Teulada. Upon arrival in Chia (about 45 km) you may choose between two different ways to reach Teulada: a striking coastal road or an equally impressive internal road. The coastal road is taken going left on SS 195 at the crossroads with Chia. After about 20 km you enter Teulada westwards through its main street, Via Sulcis. Follow the road all the way up to the Police Station (Carabinieri). Just before the Carabinieri turn left uphill and take Piazza Martiri. Follow the road to the end (approx. 200 mt) and turn right at the Pharmacy (Farmacia). Follow the road, Via Umberto I, for about 20 mt and you’ll see the main square with the church of Teulada. Go around the square, following the road and CASA TEULADA is 20 more mt. away, the stunning red house overlooking the others. The Bathroom is extremely functional, tastefully decorated and carefully laid out. It comprises an open stone wall shower with terracotta floor, suspended WC and bidet, precious CeraSarda ceramic tiles, hand carved wooden furniture, hairdryer and towels. The outdoor private large terrace features an outdoor shower for embracing the benefit of exciting open air showering. The outside area is structured in a large walled rural courtyard (about 200 square m), divided into a communal area and two small squares, each with individual outdoor shower, BBQ and sunbathing area. 1 square is exclusive use of renters, as it belongs to the property 'CASA TEULADA' and has restricted access, while the other opposite square is use of CASA TEULADA 2's guests. There is also a beautiful central olive tree and an old fisherman's boat, which will be soon turned into an extremely pleasant outdoor lounge seating area. Future plans consider adding a wooden structure on the patio for holding pendent bougainvillea and jasmine. Is this Property not available on your desired dates? 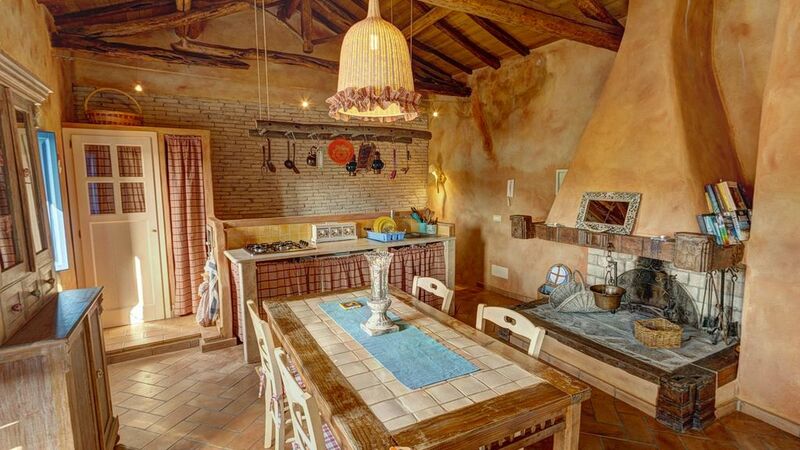 Check our sister Property # 83765, CASA TEULADA .A Tuscan alternative to Sardinia ? Plan a vacation to Florence and the Chianti area at our Partner Property, CASA FIRENZE-MONTELORO - CASA TEULADA proudly announces its No.1 position on Holiday Rentals Italy's Top 10 Most Reviewed Properties. Thank you for choosing our Casa Teulada :) We're glad you had a great time and hope to host you again in the near future. Casa Teulada - An outstanding Experience ! The Host - Antonio - is an amazing person to get in initial touch with. He helped in every regard and gave as all the information about the place, the region, nice places and beaches. He responded nearly 5 minutes after my email has been sent! Great, Thank you Antonio!! We will always come back and we are really looking forward to being the guests of Antonio again!!! A truly amazing place to stay. The hosts and the family who assist while the hosts are away are both very helpful and lovely. The house is very clean and has practically everything you need. Town of Teulada is set in a beautiful area and not very touristy at all, which is great if you like that of thing. Absolutely stunning coastline and beaches, Tramatzu the closest being our favourite. Would definitely recommend the coastal drive from Cagliari. Would happily recommend this place to anyone and would definitely return given the opportunity! Casa Teulada 2 is wonderfully familiar to us, this being our second visit with our next one in the planning. It has everything we need to guarantee our week of comfort in Sardinia in our home from home. The decor is so very well done and everything is beautifully in its place for preparing for days in the sun and evenings of dining and relaxing in the peace and tranquility. The village has a Monday morning market to stock up on fresh fruit, vegetables and meat for the week. Alternatively, there is a choice of mini supermarkets, one just down the road you could run to in 30 seconds with a second just a stroll further down and across the main road, over the bridge. As for the beaches, Portu Tramatzu is a stones-throw away and is our firm favourite. Sandy beaches and beautiful blue sea perfect for us all, including our 4 year-old, to play and swim the days away. Hearing our home being familiar to our guests is some of the nicest compliments we wish we could read, thank you so much! Your explanation of the must see and do is of great value for those reading. The highlights are almost all there: the monday market, the friendly locals, the great genunine food, the affordable prices, the convenience of having everything just a stone-throw away, so no need to spend too much energy to get what you are looking for...this is simply a great plus when you are on holiday and think about relaxing. We just arrived back in Australia on Friday. We had the most wonderful European holiday. We were fortunate to have very good weather in Teulada, and really enjoyed our time on Sardinia. Your casa was delightful and we had a wonderful stay. We were very comfortable in your accommodation and appreciated the superb amenities and the cleanliness of the casa. We loved the courtyard and spent a couple of afternoons basking in the sunlight with Sardinian wine and antipasti. What a life! We did several day trips and especially loved your local beach Porto Tramatzu. We have very fond memories of our time and hope that we can visit again one day. Thank you for your lovely casa and the memories it has provided. Plane to Cagliari, Olbia or Alghero (Ryanair,Easyjet, BA from UK). Ferry from Genova,Livorno,Civitavecchia to Cagliari, Olbia, Porto Torres. Upon arrival in Chia (about 45 km) you may choose between two different ways to reach Teulada: a striking coastal road or an equally impressive internal road. The coastal road is taken going left on SS 195 at the crossroads with Chia on SP71. After about 20 km you enter Teulada westwards through its main street, Via Sulcis. Follow the road all the way up to the Police Station (Carabinieri). Just before the Carabinieri turn left uphill and take Piazza Martiri. Follow the road to the end (approx. 200 mt) and turn right at the Pharmacy (Farmacia). Follow the road, Via Umberto I, for about 20 mt and you’ll see the main square with the church of Teulada. Keep driving 20mt. and you'll see CASA TEULADA, the stunning red house on the left corner of the road.